SwingSetMall.com has been in the business of bringing playground fun to families, schools and churches across the world since 1989. Our customers know us best for our expert and knowledgeable advice and superior customer service that puts us above our competitors. With nearly 1,000 products in our store (and growing), we are proud to be the largest provider of swing set parts and accessories online. We are dedicated to providing you the best equipment, from the most reliable manufacturers on the market today with the highest attention to product quality, durability, and warranty. We do all this at with the guarantee of providing the lowest prices on orders delivered to your door. We will happily match — and beat by 10% of the difference — any competitor's prices. Even better, we offer Free Shipping on ANY order over $99 shipping to the contiguous USA. It's these reasons which make SwingSetMall.com the #1 place online to shop for all your playground needs. Over twenty-five years later, the business is still family owned and run. In 2008, Glenn & Lori brought in their son-in-law Andrew St.Hilaire to learn the trade and help grow the business. Eight years later, they sold the business to Andrew, and today the company carries on the same original mission and builds upon its family-focused foundation. You can shop in peace knowing your order will be handled with a human-touch by people who have over two decades worth of experience providing playground fun to schools, parks, churches and families across the world. We sell directly from our own warehouse in Washington and from manufacturers of high quality designs, plans, parts, accessories, and equipment for both your backyard swing set and commercial play structures. All products sold are new, not reconditioned, and carry the full manufacturer's warranty unless otherwise stated. We only offer the best equipment, from the most reliable manufacturers on the market today with the highest attention to product quality, durability, and warranty. All items we sell are intended for use by children as young as 18 months and not over 12 years old, unless otherwise indicated. Please visit the Playground Safety page for additional important information. We are committed to bringing you quality products that are safe, affordable and fun for your kids, expert advice from knowledgeable sales representatives, and superior customer service that puts us above our competitors. But, if that's not enough, check out 5 great reasons our customers choose to shop with us. 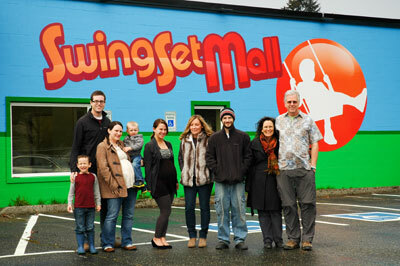 SwingSetMall.com is what it is because of our amazing team!